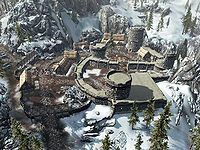 Helgen is a town located within Falkreath Hold, near the Skyrim-Cyrodiil border. It is the first town that you enter in the game, transported there to be executed. Largely militarily run, the town is dotted with military towers and buildings. Shortly after your arrival, the town comes under attack by Alduin, an ancient dragon, and you are forced to escape through Helgen Keep. If you return to the town after a few days, the ruins will be inhabited by a group of bandits. 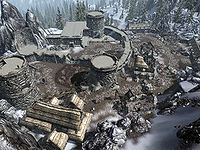 * Here only during the opening quest, Unbound, after which bandits will take over Helgen. † Never seen again after the beginning of the game—presumably killed. †† Killed while attempting to escape. Unbound: Escapar da custódia Imperial e do ataque de um dragão. During the introductory cinematic prior to the initial quest Unbound, Ralof remembers Vilod, who used to make mead with juniper berries. If you later return to Helgen, bottles of this may be found on the second story of Helgen Homestead, the partially destroyed inn that you jumped into during Unbound. Helgen is the default destination for bad AI targets, meaning that bugged NPCs may end up wandering nearby. Approximately halfway down the road to Pinewatch, a small group of bandits has set up camp under an overhanging ledge. The only notable items among their belongings are a novice-locked chest and a copy of the Light Armor skill book The Refugees. Esta página foi modificada pela última vez à(s) 07h05min de 8 de fevereiro de 2016.